Up to an inch of lake effect snow may fall in some parts of the eastern FLX today, with a mix of clouds and sun elsewhere. Lake effect snow showers south of Lake Ontario will impact the eastern half of the Finger Lakes on Monday. Cold air filtering into the region on a north wind has brought the lake effect down into the Finger Lakes overnight. The lake effect is mostly light, but a few heavier squalls will be possible from time to time, especially this morning. The lake effect will likely stay in about the same position as it is early this morning. The best chance for some accumulating snow, up to an inch, will be between Cayuga Lake and Interstate 81. This does not include what has fallen overnight. Temperatures will slowly rise from the upper 20s into the low and mid 30s. With sub-freezing temperatures, a few slick spots will be possible on the lesser traveled and rural roads. The lake effect will slowly dissipate throughout the day, but at least a few flurries will likely linger into the afternoon hours. 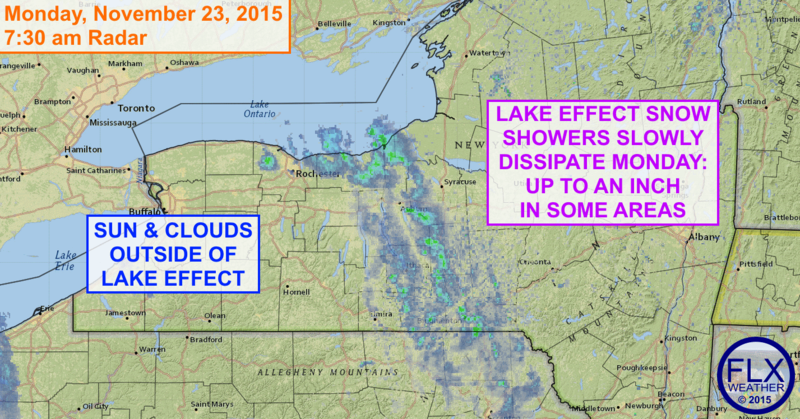 Winds will shift tonight, removing the lake effect from the Finger Lakes area. Outside of the lake effect, there will be a mix of sun and clouds on Monday. Tuesday, mostly cloudy skies should spread across the Finger Lakes, with a flurry or rain shower late in the day. The sun should return for Wednesday, with temperatures in the 40s. Thanksgiving may be a bit on the cloudy side, but highs should get over 50 degrees for most areas.